As we enter Week 13 of the fantasy football season, it’s that time of the week again when we scour the waiver wire for the top IDP prospects. The fantasy playoffs are essentially all but here, so good luck moving forward. 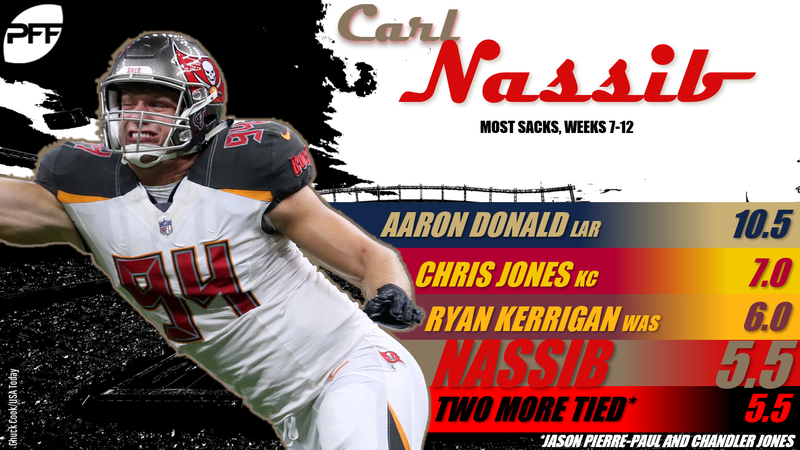 After listing Nassib last week because of his sack streak, I’m happy to post his name on this list again after he added a sack and forced fumble in Week 12. That now makes five sacks in the last six games in what is a career year for the former Cleveland Brown. Although he proved his splash-playability once again, he remains a sack-dependent play as his tackle numbers are on the low side. The veteran has been wreaking havoc in opposing backfields over the last month, registering 3.5 sacks in his last three games to go with four hits and 10 hurries. In fact, since Week 9, our pass-rush productivity metric makes him the hottest pass-rusher in football, something worth bearing in mind if you need a plug-and-play defensive end for a few weeks.